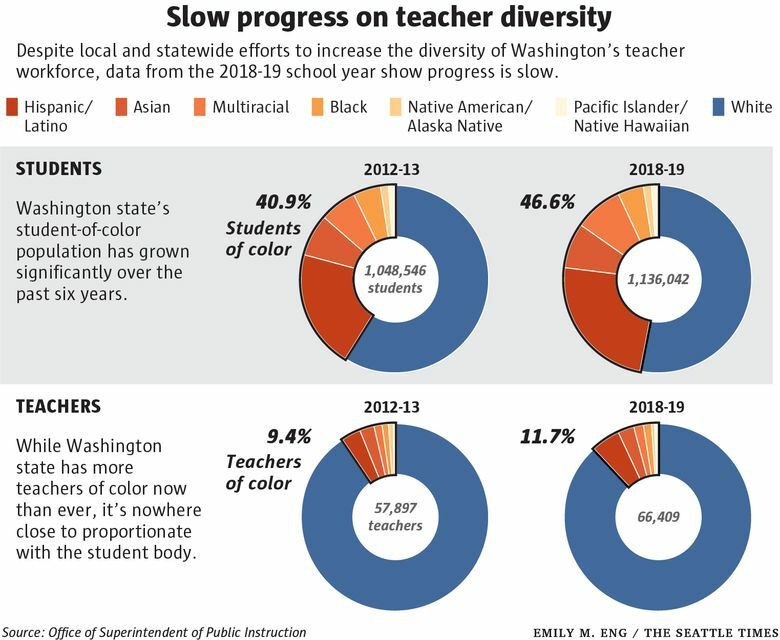 Yet in Washington state, where students of color are quickly approaching nearly half of the state’s public-school population, people of color make up only 11.7 percent of their teachers, according to new state education-department data from the 2018-19 school year. Though there are more teachers of color now than ever, that divide is slightly wider — less than half a percentage point — compared to last year, continuing a decades-long pattern. At the current rate of change for both teachers and students, it would take more than a century for the two to become proportionate. Overall, progress is sluggish: only a 2 percentage point increase in the share of teachers of color since the 2012-2013 school year. The gap — as a 2018 joint series from The Seattle Times and The Columbian revealed — is largely the result of longstanding barriers to a college education, high turnover among teachers and a rapidly changing student body. The divide between Hispanic/Latino students and educators is still the largest of any group, and continues to grow. To be proportionate with the student population this year, the state would need to add 12,395 Hispanic/Latino teachers. The number of teachers of color required for parity with Latino students and other students of color is about equal to the number of residents in Kenmore, around 23,000. The series also showed how education officials in the Seattle and Vancouver areas stepped up their response to these barriers in recent years. Some of those efforts, which include scholarships for college, are bearing fruit. To speed progress, lawmakers are considering proposals for more state action. In addition to more funding for programs that show a track record of producing more educators of color, Washington’s governor-appointed Professional Educator Standards Board (PESB) requested legislation that would eliminate the requirement to pass an exam before entering a teaching college. The state House passed the bill unanimously this month, and it awaits a Senate vote. People of color fail the three-part exam, called the WEST-B, at higher rates than white test takers, according to a PESB report. The time required to prepare for the test, the linguistic barrier for bilingual test takers and the costs of retaking the exam are gatekeeping the profession even further, said Alexandra Manuel, PESB’s executive director. Removing the requirement would “encourage programs to understand the unique needs of each candidate,” and provide supplemental classes and training where necessary, said Manuel. If the bill is signed into law, everyone would still need to take the exam for entrance, but programs could give equal weight to other parts of a candidate’s application. But there is still a larger recruitment issue highlighted by the test-score data. Regardless of whether a candidate passes the WEST-B, nearly 50 percent of candidates of color don’t continue with a teaching program afterward, compared to 42 percent of white candidates. Expanding enrollment for programs that usher students through the whole process of becoming a teacher — from college admissions to placement in a classroom — may help with this attrition, said Manuel.